It was my version of one Martha Stewart had made. 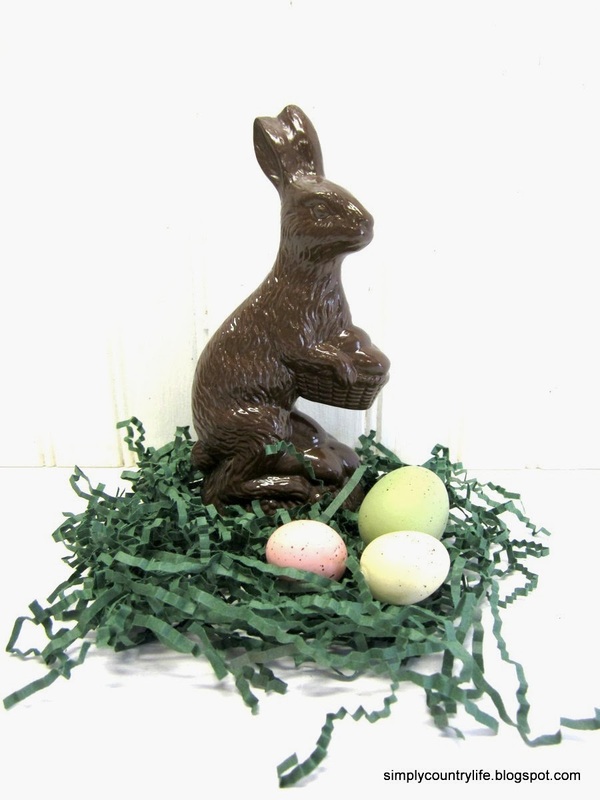 I had searched for the faux chocolate bunny for a while before I found one at Hobby Lobby. I checked this year and haven't found any there yet. and because they seem to be hard to find I thought I would share an inexpensive option. You may already have everything you need to make one. with the intention of turning him chocolate. I almost forgot to take a before pic and started painting his front side. I like to use the gloss finish for this because it gives the "chocolate"
You can use whatever finish you like. Here are a couple little dollar store bunnies I painted last year. I happened to have them and wanted to see if they would look like chocolate if I painted them. I decided to hand paint the flowers on the eggs with acrylic craft paint. I haven't used these little guys in a project yet. I think they definitely resemble a chocolate bunny. When do you start decorating for Easter? April 20th seems so far away still. Clever to make our own faux chocolate bunnies. I'm going to remember this! Great idea to repurpose some of those not so "pretty" bunnies. I'm definitely going to steal this idea...thanks! Definitely makes you look at those "not so pretty" bunnies differently. Thanks Kelly. I'm trying to come up with a neutral, rustic look this year. The pastel colors normally associated with Easter just don't work in our cabin. Thank you Sherri. That Martha basket has been one of my favorites for the longest time! I love your version too! And what a cute chocolate bunny! Isn't her basket wonderful! Thank you so much! Brilliant idea! I would love it if you would come join us for Centerpiece Wednesday on my blog and share your creativity with us. http://thestylesisters.blogspot.com/2014/03/centerpiece-wednesday-115-see-and-share.html Hope you will come and party with us. Karin, thank you so much! I'll be right over!